In attending the First 1001 Critical Days APPG meetings held at Parliament, I learned about this campaign. If you wish to impact on the future of our children and society, please read on and get involved! This is a growing network of supported information and guidance on how to do this. ‘How is it that so many of us in the ‘early years’ world are so acutely aware of the importance of the conception to age 2 period – yet in the ‘outside world’ it’s virtually never discussed? The 70/30 grassroots campaign aims to change this. We want to create a real public conversation around the importance of a secure, nurturing environment for babies and positive attachment in the early years. We want to get politicians on board and promote policies that support parents and families, and prevent child maltreatment before it begins. We call this ‘primary prevention’. Yet back in the ‘outside world’, children’s centres are closing, and the relatively few preventive services that exist are being cut back in many areas around the UK. We are pushing back on this. 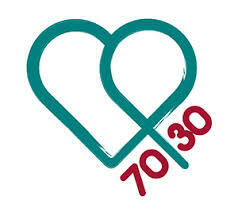 70/30 Ambassadors across the country are meeting local politicians and MPs, writing to local papers, joining local festivals and engaging their neighbourhood early years charities and organisations. We need your help with this. If enough of us tell politicians we care about this issue, they will start talking about it. If enough letters, op-eds and press releases appear in local papers, the nationals will pick it up. We have already learned a few things in our campaigning. One is that people do care about the early years – they just don’t feel they have a role to play, or the power to make things change. We know we do! If enough of us do a little (or a lot…) the 70/30 goal will become a real ‘hot issue’, and investment in primary prevention will follow. One MP we often quote told his constituent that once his office receives 6 letters on a specific campaign, they start looking at it seriously. The 70/30 Short Film Contest – we are running a contest for 16-18 year olds with an interest in film making across the UK. Entrants are invited to create a short film – max. 3 minutes – sharing the 70/30 campaign and why it matters. First prize is £1,000, plus another £750 for the winner’s school or college! Find out more at http://shortfilmcontest.70-30.org.uk/. What an excellent post. Thank you – and keep it up in any way you can. It is through people like you that 70/30 will be achieved.